Reproduction of the Order of the Red Star. It was established by decree of the Presidium of the Supreme Soviet of the USSR of 6 April 1930. 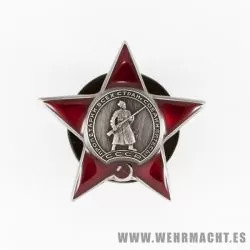 The Order of the Red Star was awarded to soldiers of the Soviet Army, Navy, border and internal security forces, employees of the State Security Committee of the USSR.